This is the first battle of my over-ambitious plan to replay the whole of the Second World War. The basis of the “campaign” is the Axis & Allies game, with the 1939 set-up that I found some years ago on the web. I think it was published by Peter Sides. Campaign moves are determined by information from two books; “World War II Day by Day” and “The Chronicle of World War Two”. Whatever happens in the game, history will try to reassert itself. So, in the first German game turn I have a battle in Poland. In square 6126 the German 2nd Tank Army is attacking the Polish 1st Infantry Army, with support from the 1st German Infantry Army. (In an earlier post I indicated that Axis & Allies units might become “armies”). The strategic situation after the German move on 1st September. 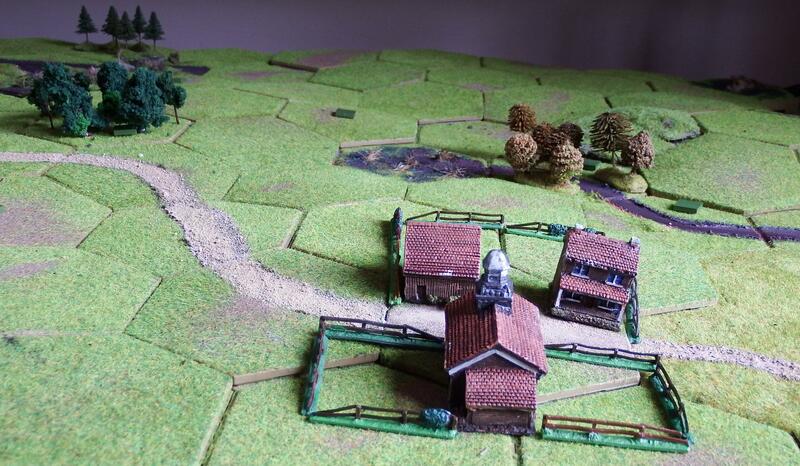 The terrain was randomised using a deck of cards and a Memoir 44 game board. 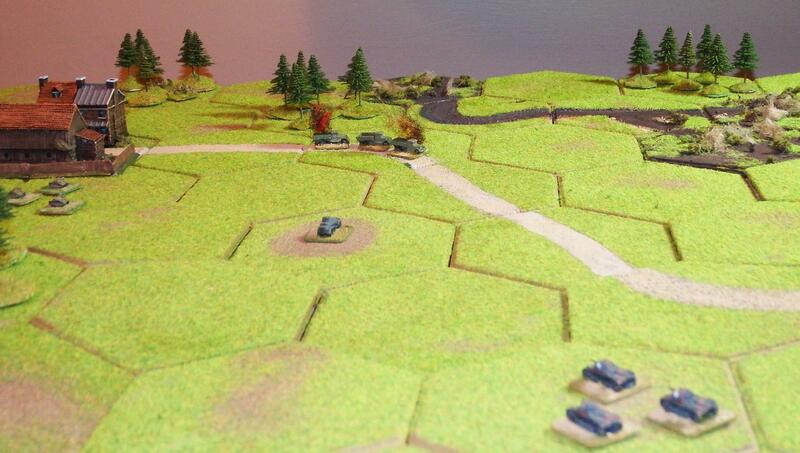 The resulting “map” was transferred to a wargame table using Kallistra hexagon tiles, some customised to provide the necessary terrain features. The names of the three villages, Cerekwica, Mrowino and Napachanie were chosen simply because I found on Google Maps three settlements in the area with a similar geographical relationship. I think it’s better than using “Village A” or “Southeast Farm” or similar. The battle would be won by the first side to achieve seven victory points. Possession of each of the three villages counted as 1VP and destruction of one entire enemy unit was worth 1VP. The battlefield viewed from the southwest. Cerekwica on the left, then Mrowino. 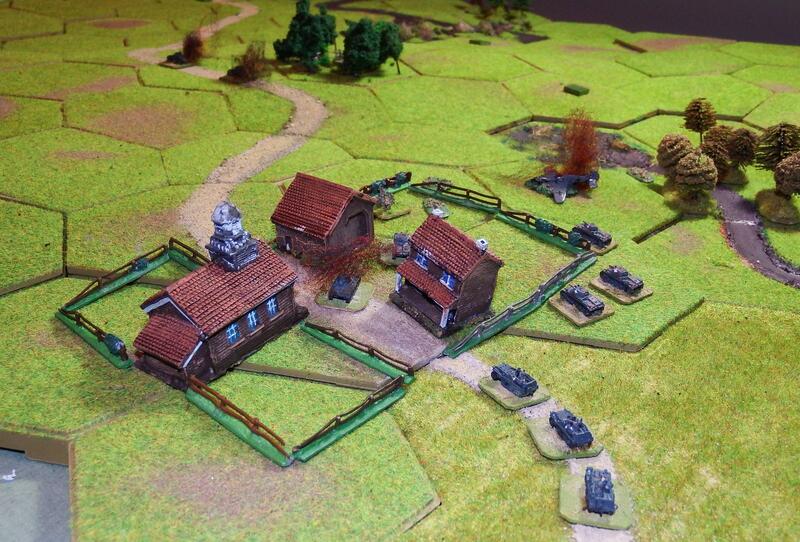 Both villages are occupied by Polish infantry. View of the eastern flank from the south. The village of Napachanie. The wood to the left is on a hill, not obvious in this view. The axis of attack for the German 2nd Tank Army. 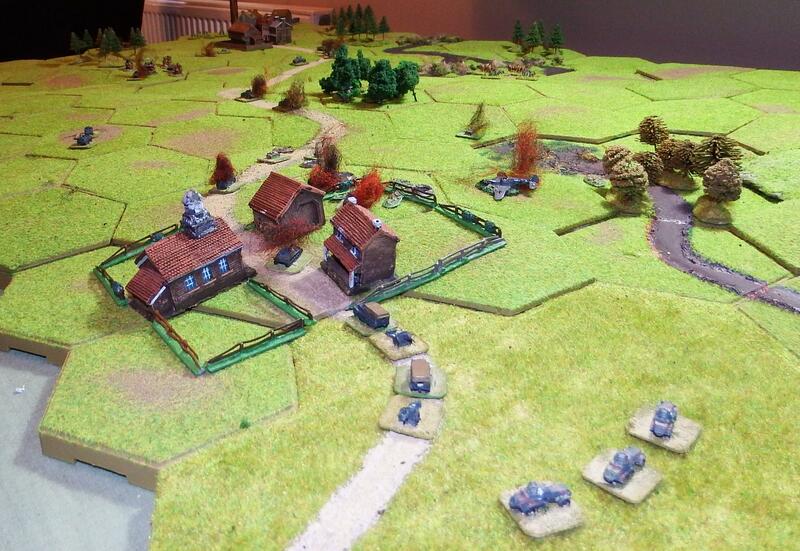 The green counters represent Polish forces not yet revealed, including some blanks. The Germans began with a reconnaissance flight by a ME109, which spotted and strafed the Polish infantry in a wood north of Napachanie. 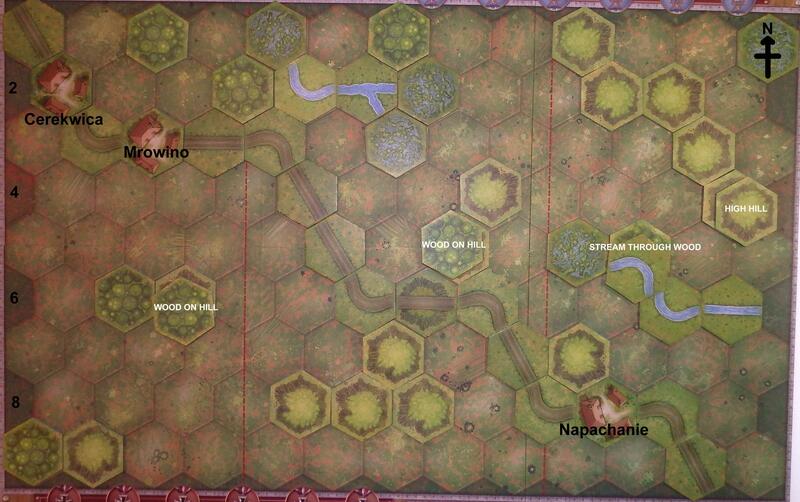 The remaining Polish infantry made a break for Napachanie from the wood. 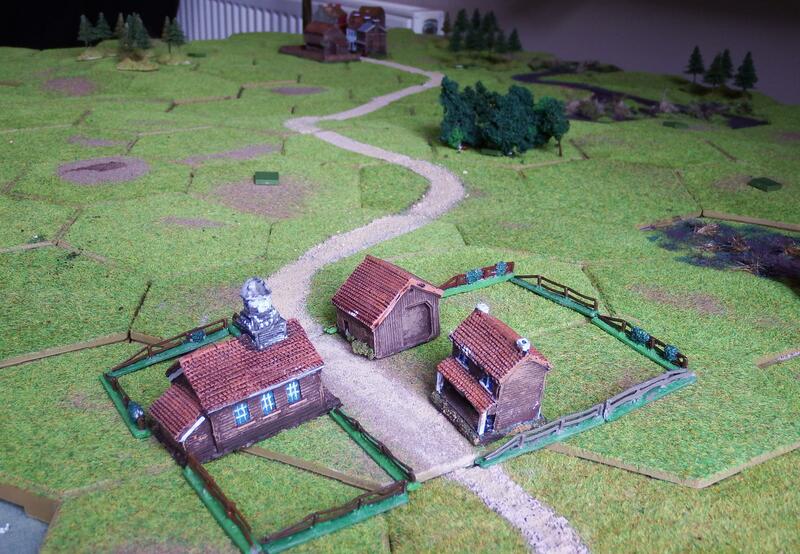 A second, as yet unidentified, unit moved off the hill to the right of the picture. 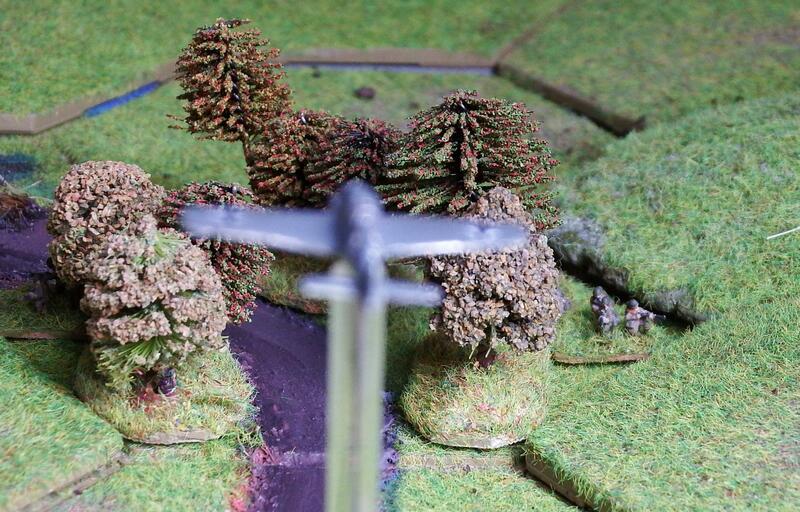 …but was shot down by the jubilant Poles. 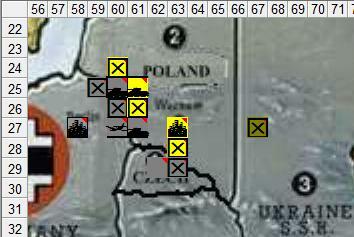 Meanwhile in the northwest German infantry made a pincer attack on Cerekwica, defended by a company of Polish infantry. Normally I try to work without tokens on the table, but sometimes it’s necessary. Each of my units has a small ID card that I can slip under the buildings to indicate their position if in occupation. Despite a counterattack that caused a number of German casualties the Poles were forced back into the woods. A German supply convoy arrived. I changed the rule about retreating. 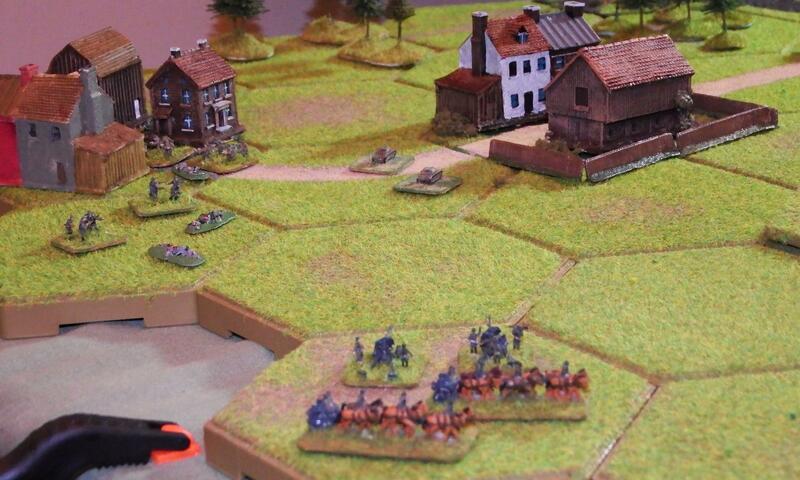 Memoir 44 rules state that a retreating unit must move towards its baseline. 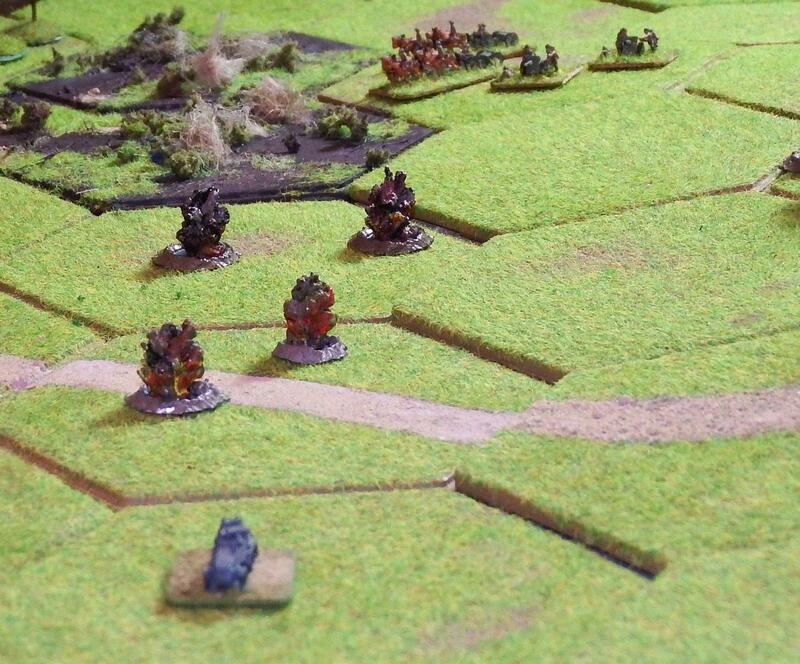 With a flank attack in progress I ruled that it must retreat directly away from the major threat. 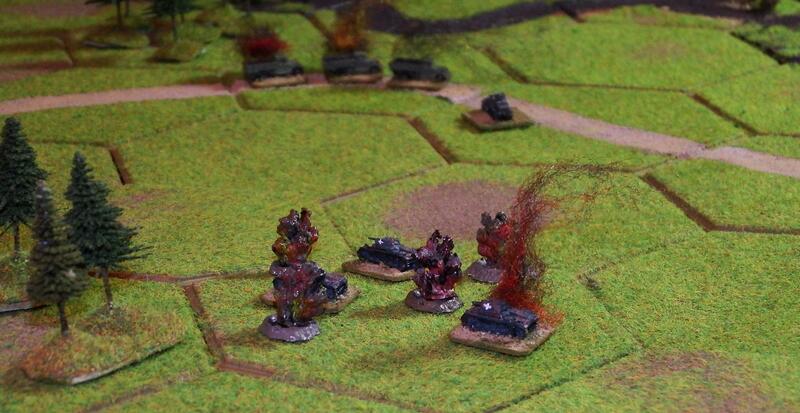 The purpose of the lorries in Memoir 44 is to “resupply” units that have suffered casualties. One base may be restored by removing one lorry. In the event there was no opportunity to do so. At Napachanie a company of Pz IIs took over from the armoured cars and began to machine gun the Polish infantry. The armoured cars set off to recce the road to the northwest. But as they passed the wood on the crest of the ridge, the hidden Polish unit in the wood opened up with an anti-tank rifle and took out two of them. The third beat a hasty retreat. Dobry strzał! The Poles at Napachanie had knocked out one Pz II, but more German armour was swiftly approaching. The Poles counterattacked. A unit of TK3 tankettes with 20mm guns advanced, supported by a 75mm gun battery (top centre). Two more German tanks were destroyed by shellfire. 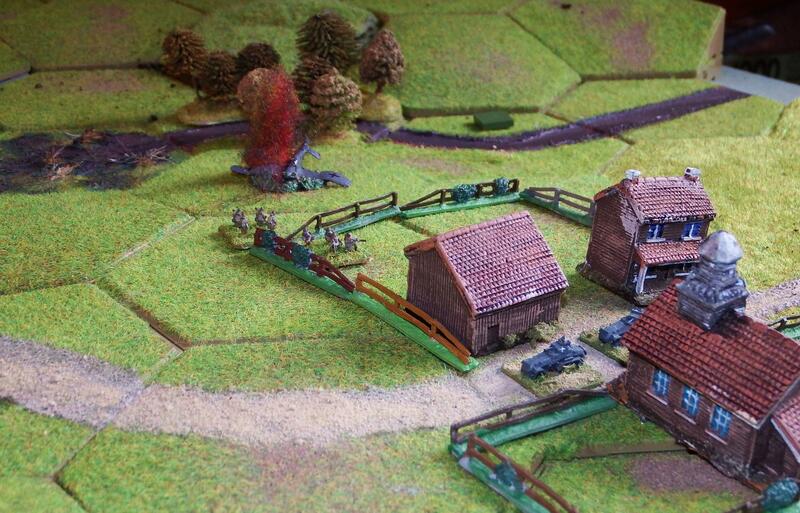 On the western flank things were not going well for the Germans. Rifle fire from the Poles in the woods was inflicting casualties on the Germans in Cerekwica (left) and the Poles in Mrowino (right) were holding up the advance of the German infantry across the open fields. 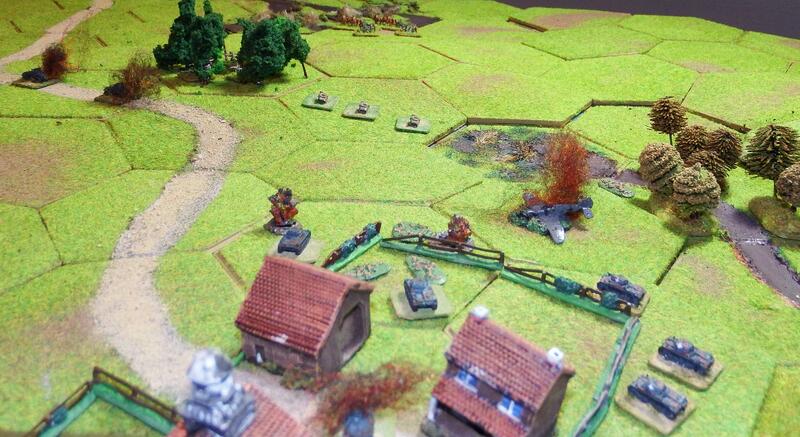 A unit of TK3 tankettes with MG armament emerged from the wood NE of Mrowino in support of the infantry. A Polish supply unit prepared to withdraw to safety. Napachanie: The Polish and German armour began to “mix it” while some armoured half tracks set off to deal with the AT rifle unit in the central wood. An overview of the eastern flank from the southwest. The Polish armour (centre) has chased off the German light tanks (bottom right), with help from their artillery (top left). 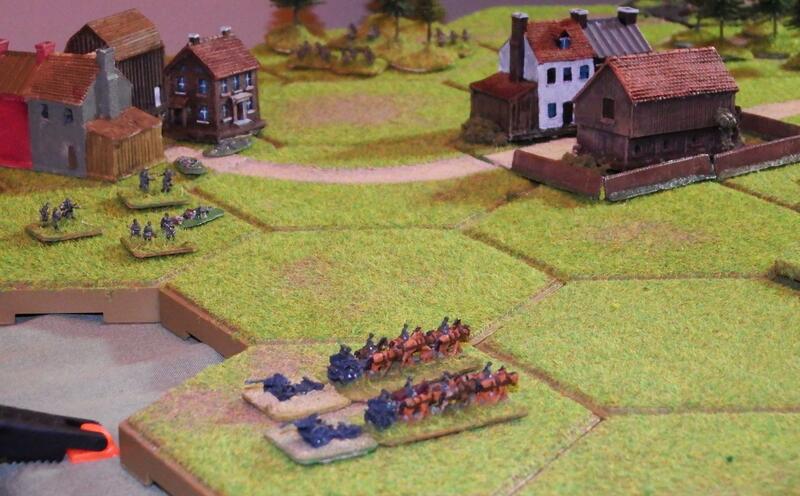 …and horse-drawn guns on the western flank. In the centre the remaining German armoured car surprised the Polish truck convoy, destroying two of the three trucks. 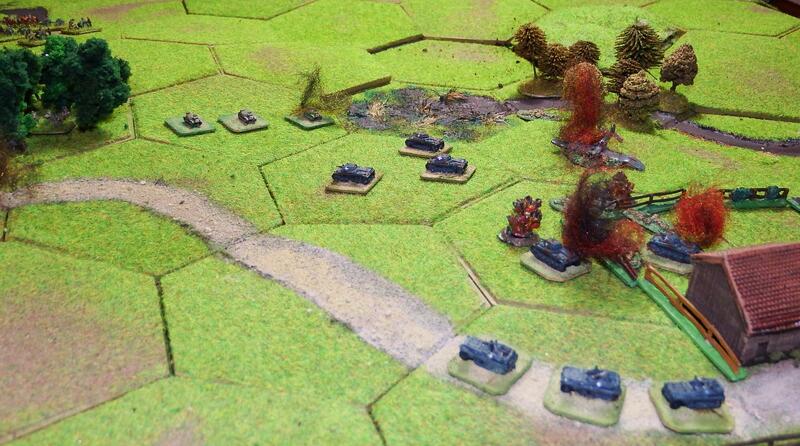 The German tanks kept well to the south of the dangerous wood as they headed for Mrowino. Napachanie: The TK3s turned their attention on the German half tracks. Mrowino. 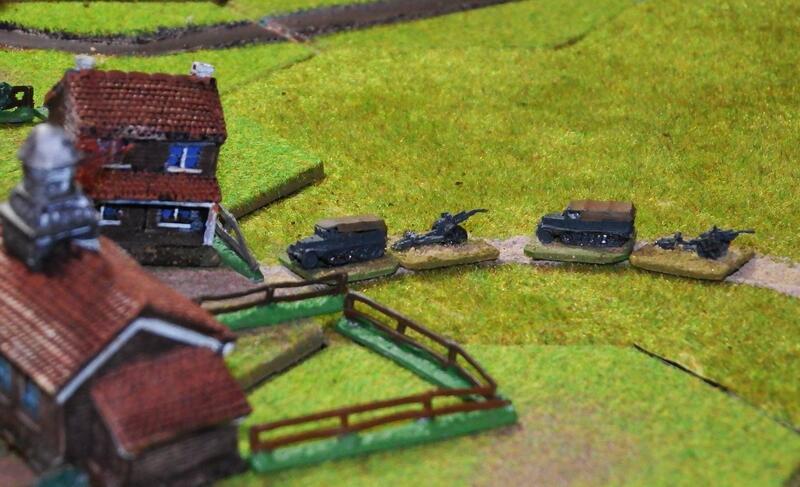 The last Polish truck exploded and the Pz II unit caught the Polish tankettes from the rear. 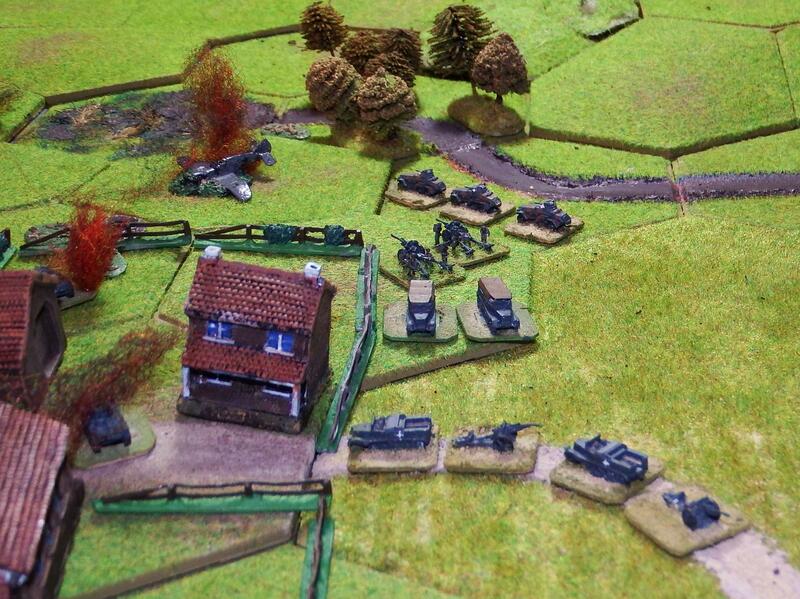 But the Poles called in off-table heavy artillery to deal with the German tanks. From the southeast looking along the German axis of attack, the road littered with burning vehicles. Napachanie: The Germans began to deploy their 105mm howitzers. 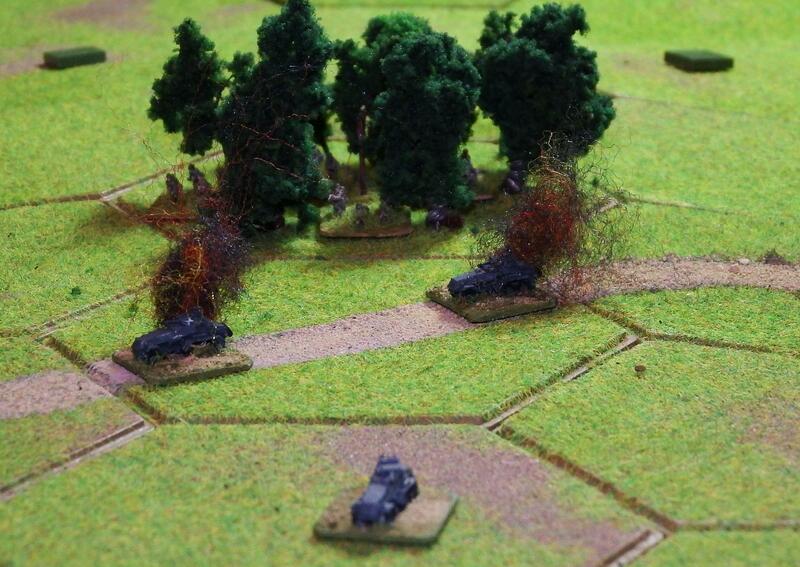 Cerekwica was retaken by Polish infantry, while their tankettes machine gunned the supporting German infantry. 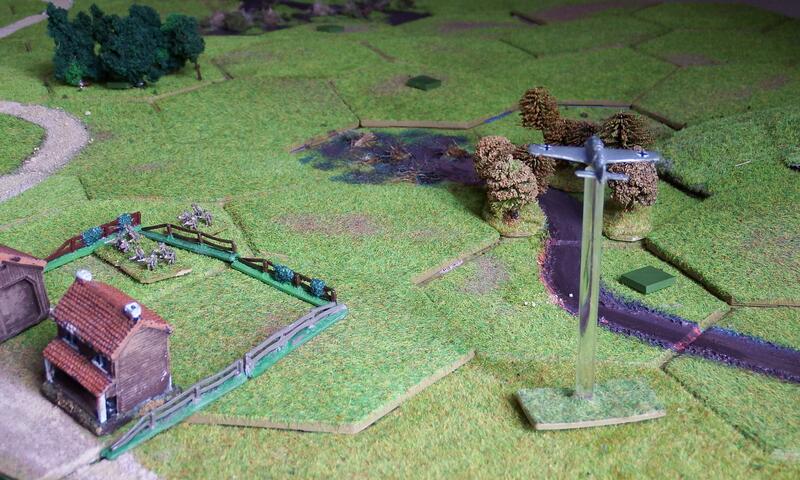 Cerekwica/Mrowino: The Germans deployed their 105mm guns in direct fire mode. 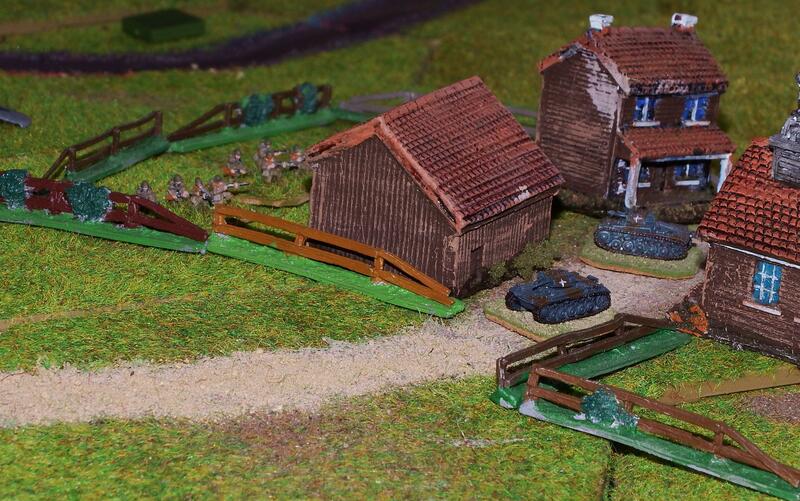 Despite casualties from the German artillery fire the Poles held on to Mrowino, but only just. 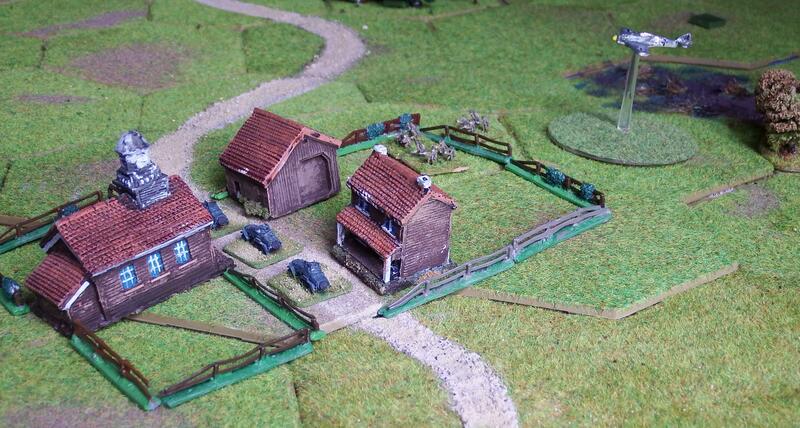 Back in the centre the German armoured car ran from a creeping artillery barrage. The Polish tankettes eliminated the last of the German infantry around Cerekwica and (behind the village to the left) Polish infantry attacked and destroyed the German supply convoy. This marked the end of the battle. The Poles had eliminated five German units, including the ME109, or forced them to retreat from the battlefield, and recaptured two villages for the required seven victory points. 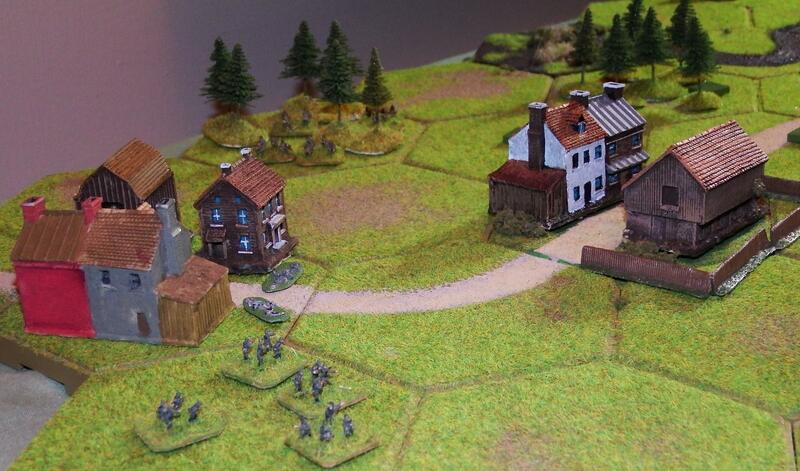 The Germans had taken and held Napachanie in the southeast and eliminated two Polish units, a total of three points. The game took fourteen turns for each player. At the end of turn 9 the victory point score was 4-4, and things were looking desperate for the Poles. Five turns later they won 7-3. 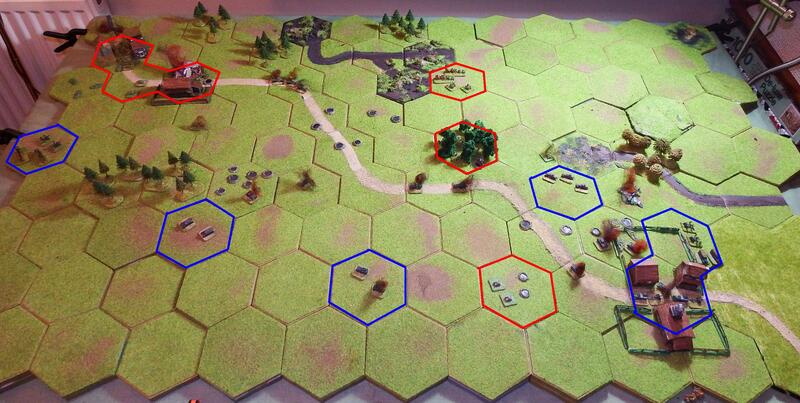 I think that Memoir 44 works best for set piece battles, or at least those with most of the forces on the field at the start. 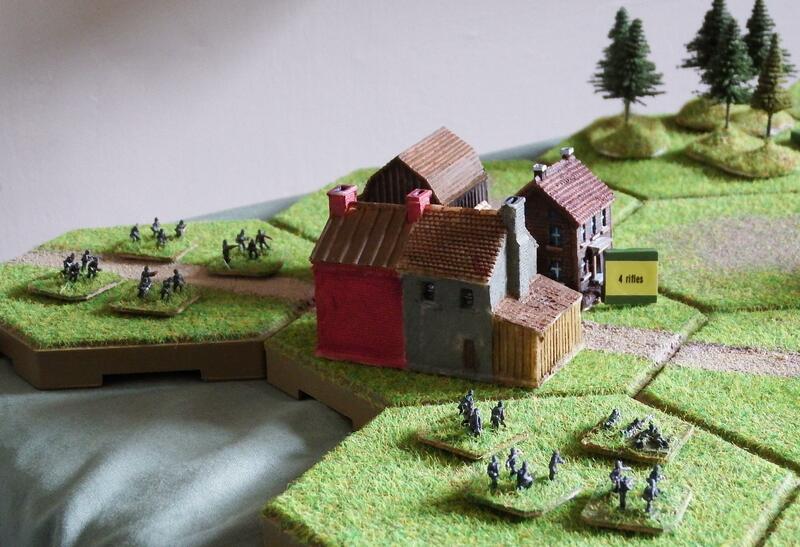 Because most of the command cards relate to right flank, left flank or centre the battle can become disjointed when trying to feed in troops at specific points. Each player in this game had four cards to select from at any one time, but the Poles got many of the “specials” like off-table artillery barrage. 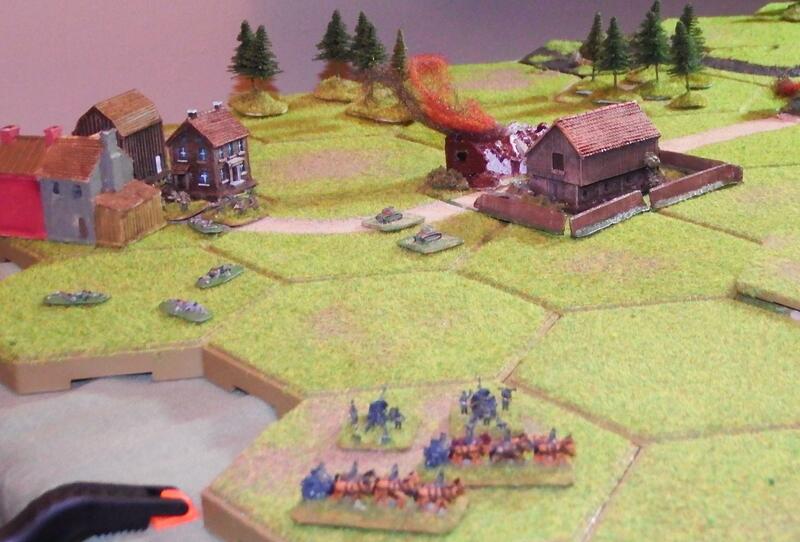 For almost half the game the Germans held three cards for a flank with one unit and one card for the flank with most of their forces. As a first time exercise I think it worked well. I replayed part of the game later with Rapid Fire rules and it was clear that the firing was less devastating and the German superiority of numbers would overcome the Poles sooner or later. And so I reach the end of the first day of the replay of the War. It’s only taken about a year to prepare and play. At this rate I will be 2,137 years old before I finish! You’ll still be a whippersnapper at 2,137! This looks like tremendous fun. Really great report. I’m happy for the gallant Poles. I feel your pain regarding the slow pace of wargames projects.